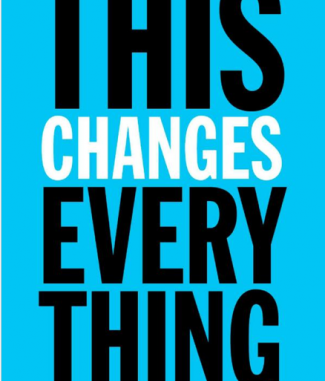 To say that Naomi Klein’s new book This Changes Everything: Capitalism vs. Climate Change is disappointing is an understatement. Klein’s best seller Shock Doctrine was a tour de force. For several years after its publication, it was a pleasure to see Naomi Klein fearlessly debating Alan Greenspan and putting him neatly in his place. I am still waiting for the book on climate change that deals with reality, makes sense of the issues and frames the uncertainty for busy people with little or no scientific background. Understand the relationship between fossil fuels and the current dollar reserve currency status. As Chris Powell once said, “fiat currency has done far more environmental damage, then all the mining companies have ever dreamt of doing.” This discussion would include an understanding of Jim Norman’s “Oil Card” and the national security management of global oil prices as an essential component of our current system. In addition it would have to address the two most important issues to consider when addressing our climate and environmental issues. First, we need to question why and how we have come to be dependent on fossil fuels which are managed on a centralized basis. Currently, 87% of our global energy use is provided by fossil fuels. Why? Numerous inventors from Tesla onwards have put forward inventions that would allow us to shift away from fossil fuels. We have a clear history of suppression of a robust selection of breakthrough energy technology. This history needs to be reviewed and addressed, as does the relative efficiencies of renewable energy alternatives available for a new robust energy model. Second, we need to define the real problem. If climate change is happening and if it is a result of the use of fossil fuel, then it is not a primary problem. Rather it is a symptom of a problem, the real problem being our governance system. We have a governance system that has systematically engaged in – at a minimum – significant and unnecessary environmental stress and – at a maximum- is ensuring that life on earth is unsuitable for most of the population. So our real problem is not climate change, it is our governance system. Klein never addresses who and what constitutes our governance system. I presume it is because she, like the rest of us, does not know. Why are we living on a planet where we are not allowed to understand who runs things and by what process? Why is resource allocation on Planet Earth a complete mystery? Consequently, if we don’t know who is governing the key policy decisions on Planet Earth, it is fair to say that we do not have access to their intelligence and perspective on risk management of population and geophysical health. How do you build alignment with people when you do not know who they are and you do not know what they are afraid of and what their goals are? No wonder life these days feels like playing bumper cars in the dark. What we do know is that our leadership has been pouring infrastructure investment into underground facilities, the head of NASA is insisting we expand our space investment so that we not bet the ranch on one planet while governments appear to be using digital technology to implement police states. WHY? What is everyone so afraid of and why can we not talk about it? Let me tell you what the most dangerous policy action in the world is. It is to decide that a phenomenon such as climate change is our #1 problem, that we need urgent action on it before understanding who is going to control the policy discussion and implement the solutions. Build a consensus that man made climate change is our #1 problem, and I assure you that our mystery governance system will use it to achieve a global taxation system and more centralized control. Bottom line – Klein’s new book is a 466 page material omission. It is a breathless journey through many of the things that are wrong on Planet Earth. It wraps up those wrongs and enjoys a wild leap into explaining everything under one enveloping rubric of climate change on the assumption that we all know that climate change is real and a result of man made factors. Finally, it draws on numerous heartstrings to ensure these folks are good, these other folks are bad, and that action is urgent. There is no more time to ascertain the facts. She describes the importance of not giving up hope and the power of continuing to take action. So, there is lots of good stuff – enough to remind us why we are all Klein fans. However, the good stuff is wrapped in an emotional enchilada that fails to address reality, let alone provide us with a framework to deal with the issues before us. Naomi Klein has tried to define “problem-solution” within the official reality. It is fine to do so at cocktail parties. However, doing so in the world of serious policy debates simply creates a weapon that our secretive governance system -whoever they are -can use to institute – yet again – more central control. That secretive central control is the problem – not climate change. Bring transparency to our governance system and watch breakthrough solutions start to emerge on hundreds of important issues – climate change among them.